Emoryâ€™s Susan Bauer-Wu, PhD, RN, is recognized both nationally and internationally for her understanding of the mind-body connection and enhancing the quality of life for individuals affected by cancer. Her research programs aim to make a difference in the care that cancer patients receive and in the health of family caregivers. 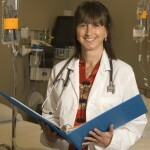 She is a national leader in palliative care and integrative medicine and health. Bauer-Wu, nurse scientist and Georgia Cancer Coalition Distinguished Cancer Scholar, joined Emory’s Nell Hodgson Woodruff School of Nursing and Emory Winship Cancer Institute faculties in 2007. Bauer-Wu studies whether psycho-behavioral interventions have a positive effect on psychological and physical health. She is currently conducting a large randomized clinical trial that looks at whether meditation affects subjective symptoms as well as lab findings such as stress hormones or how long a patientâ€™s white blood cells take to recover after a bone marrow transplant. This National Institutes of Health (NIH)-funded study has enrolled 241 patients at Emory and the Dana-Farber Cancer Institute, where Bauer-Wu previously served as director of the Phyllis F. Cantor Center for Research in Nursing and Patient Care Services. The study will finish in 2010. Bauer-Wu is also involved in research with neuro-imaging to see what parts of the brain respond to such interventions. Bauer-Wu says mindfulness meditation provides skills for the cancer patient to better cope with stressful circumstances, and in turn, the stress response can be minimized, and a sense of well-being ensues, and the cancer patient feels more relaxed, in control and physically comfortable. Bauer-Wuâ€™s interest in cancer patients began early in her career when she worked as an oncology nurse. In addition, she recently received a $3.5 million NIH grant for a study aimed at reducing heart disease risk and improving health and wellbeing among family caregivers of dementia and heart failure patients. Recently, the American Academy of Nursing inducted Bauer-Wu into its new Fellowship class of 98 top national nursing. Fellows are elected through a highly selective process that recognizes individuals who have made major contributions to nursing and health care and whose work has influenced health policies benefiting all Americans.